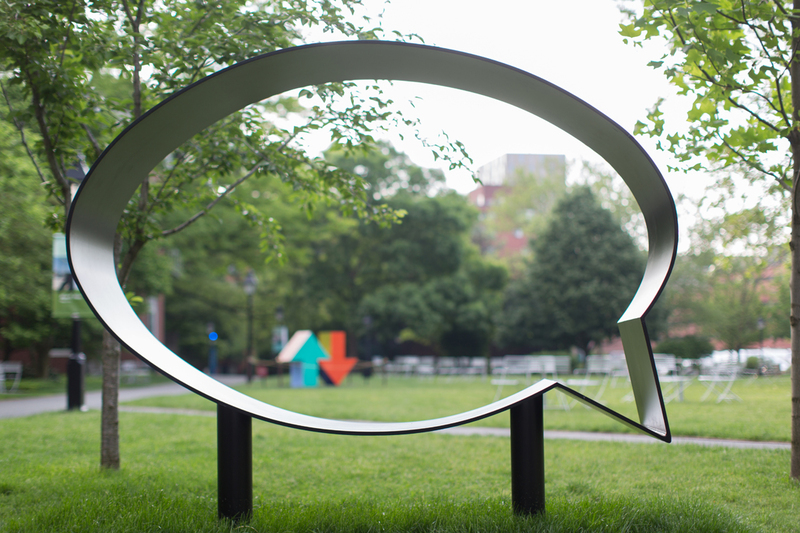 BOSTON—Harvard Business School welcomes to its Allston campus four temporary sculpture installations on loan from four prominent contemporary artists. They will be on view until April 2017. 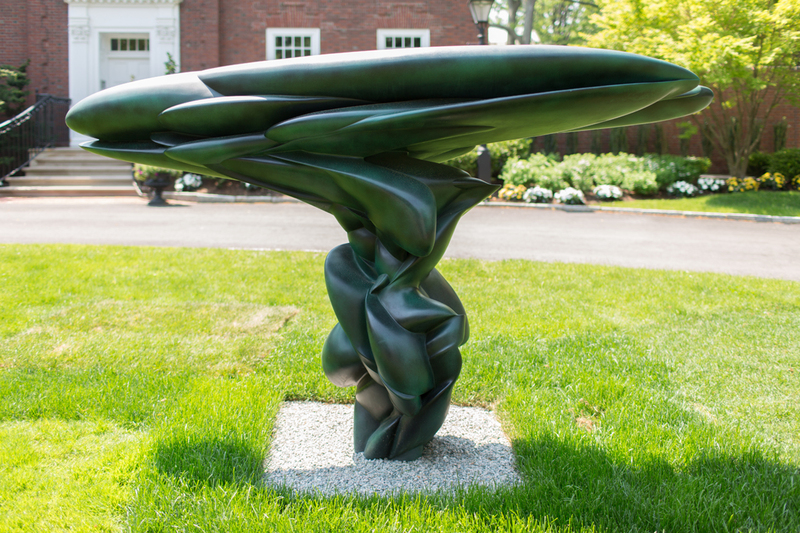 The installation’s sculptures, located at various campus locations, are nestled within the Olmsted Brothers-designed landscape of Harvard Business School’s iconic residential campus, joining permanent installations from artists Mary Frank, John Safer, and Joel Shapiro. Alongside Neo-Georgian and contemporary architecture, the exhibition complements the School’s history of innovation and leadership in a rapidly changing, dynamic environment and its mission of educating leaders who make a difference in the world. Art has been an inspiring presence on the HBS campus for decades. In addition to other collections and artifacts, the School houses the notable Schwartz Art collection, which features over 300 contemporary works purchased by means of a gift from Gerald Schwartz (MBA 1970). This exhibition is made possible by the generosity of the artists and galleries, including Tony Cragg (Lisson Gallery), Jaume Plensa (Richard Gray Gallery), Tony Tasset (Kavi Gupta Gallery), Hank Willis Thomas (Jack Shainman Gallery), curation by Kate Chertavian Fine Art, and an anonymous donor. One of Britain’s leading sculptors, Tony Cragg was born in Liverpool in 1949 and has lived and worked in Wuppertal, Germany, since 1977. He has a BA from Wimbledon School of Art and an MA from the Royal College of Art. Cragg works with a range of materials, including stone, wood, glass, aluminum, cast bronze, and found objects. He is constantly searching, through his sculptures, to find new relations between people and the material world. His recent work investigates the complex internal formal constructions and geometries that give rise to exterior forms. In Over the Earth, Cragg explores not only nature and the forces of energy found in the organic world, but also how our reality is shaped by technology as well as the changing perspectives and pace of modern life. Cragg has exhibited at the CAFA Museum in Beijing; the Scottish National Gallery, Edinburgh; Tate Gallery Liverpool; Museo Nacional Centro de Arte, Reina Sofia, Madrid; and Tate Gallery, London. He represented Britain at the 53rd Venice Biennale in 1988, and that same year he won the Turner Prize at the Tate Gallery, London. He has been a professor at the École Nationale Supérieure des Beaux-Arts in Paris (1999-2009) and professor at Kunstakademie, Düsseldorf (2009-present). He is represented by Lisson Gallery. Born in 1955 in Barcelona, Jaume Plensa studied at the Llotja School of Art and Design and at the Sant Jordi School of Fine Art. He has worked on a wide range of public art projects worldwide and is perhaps best known in the United States for his Crown Fountain in Chicago’s Millennium Park (2004). In 2014, he returned to Chicago to do a solo exhibition for Millennium Park. Titled 1004 Portraits, the exhibition expanded upon his 1000 LED portraits of Chicago residents from the Crown Fountain through the installation of four monumental cast iron portraits of young girls. Inés was one of the four sculptures included in the 1004 Portraits exhibition at Millennium Park. Her portrait, in the artist’s words, is “all at once specific, anonymous, universal, and tranquil.” Shown with her eyes closed in a state of meditation or dreaming, her serene expression inspires contemplation. Like a hologram, the sculpture changes and shifts perspectives when viewed from different angles. One of the world’s foremost sculptors working in the studio and public realm over the past thirty years, Jaume Plensa has received numerous national and international distinctions, including the Medaille de Chevalier des Arts et des Lettres, awarded by the French Ministry of Culture, in 1993. In 2009, he won the Mash Award for Excellence in Public Sculpture for his work Dream. In Spain, he received the National Prize for Fine Art in 2012 and the prestigious Velázquez Prize for the Arts in 2013. He is represented by Richard Gray Gallery. 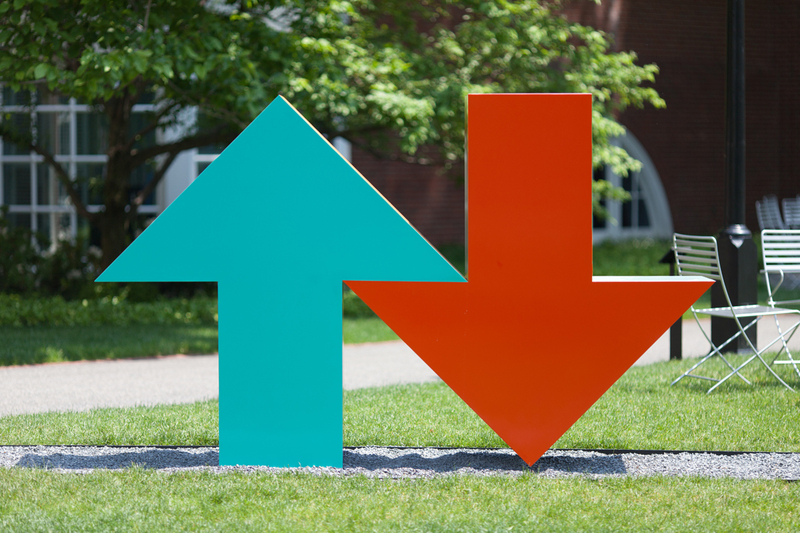 Conceptual artist Tony Tasset’s new series of paintings and sculptures, Me And My Arrow, references the Harry Nilsson song of the same title and shows his continued interest in using a pop sensibility to tap into shared visual knowledge. Tasset has said his goal with the series was to create a universal logo that expressed the contemporary environment of chronic evaluation—a graphic emblem of trending. Born in 1960 in Cincinnati, Tasset received his BFA from the Art Academy of Cincinnati and his MFA from The School of the Art Institute in Chicago. He was selected as an artist for the 2014 Whitney Biennial at the Whitney Museum of American Art, and has work in private and public collections, including the San Francisco Museum of Modern Art, Museum of Contemporary Art in Chicago, and Museum für Moderne Kunst in Frankfurt. Tasset lives and works in Chicago and is represented by Kavi Gupta Gallery. Born in New Jersey, Hank Willis Thomas is a photo-conceptual artist whose work investigates themes of identity, history, and popular culture. He received his BFA in Photography and Africana Studies from New York University and his MFA/MA in Photography and Visual Criticism from the California College of Arts. His monograph, Pitch Blackness, was published by Aperture in 2008. Thomas’s dynamic contemporary public art installation, In Search of the Truth (The Truth Booth), has been traveling the United States and recently came to Boston in April. For this ongoing project, which is funded through Kickstarter, members of the public can enter a portable, inflatable booth, where they can complete the statement "The truth is..." from their own perspectives. Thomas’s work is in numerous public collections, including The Museum of Modern Art in New York, The Solomon R. Guggenheim Museum, The Whitney Museum of American Art, The Brooklyn Museum, and the National Gallery of Art in Washington, DC. Thomas was recently appointed to the Public Design Commission for the city of New York. He is represented by the Jack Shainman Gallery in New York City and the Goodman Gallery in South Africa.